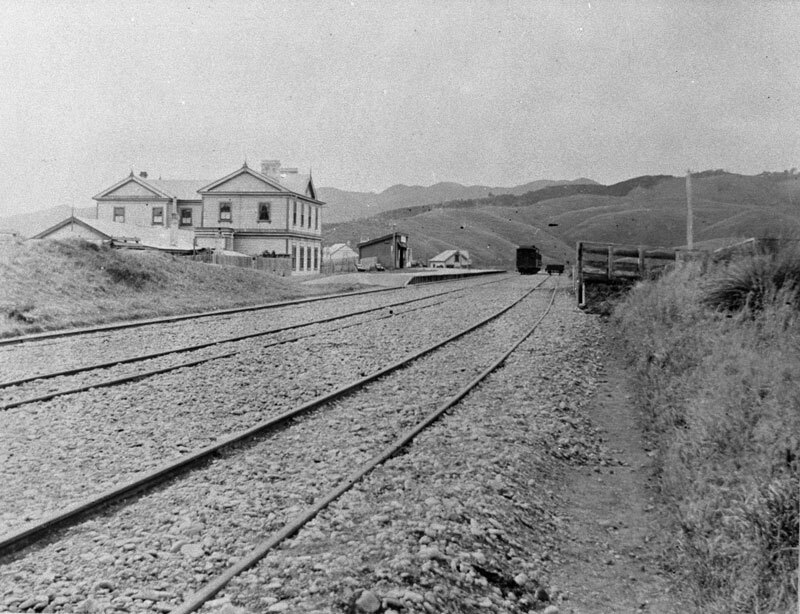 The Wellington and Manawatu Railway Company built the first station, a simple three–roomed structure, on the seaward side of the tracks in 1885. The current station, built in 1940, was designed by George Troup. In 2010, local volunteers completely refurbished the building. The first station, a simple three-room building with a mono-slope roof, was built on the seaward side of the tracks in 1885 by the Wellington and Manawatu Railway Company (W&MRC). In that year the W&MRC began a weekend train service from Wellington to Plimmerton that helped establish the area as a beach resort. It proved very popular and the Company later built Plimmerton House an accommodation house and refreshment rooms alongside the station. This was burnt down in a fire in April 1906. After the fire Steyne Avenue was extended through where Plimmerton House and the first railway station were located. It incorporated Shrewsbury Avenue which ran along to the stream at that time. The original station building may have been relocated to the other side of the track at this stage (to a position) more or less in the same vicinity as where the current building is located. The station (and new beachside settlement) was named after John Plimmer, a W&MRC company director. Other businessmen behind this new company included John Kirkcaldie, James Smith, William Levin and William Shannon. 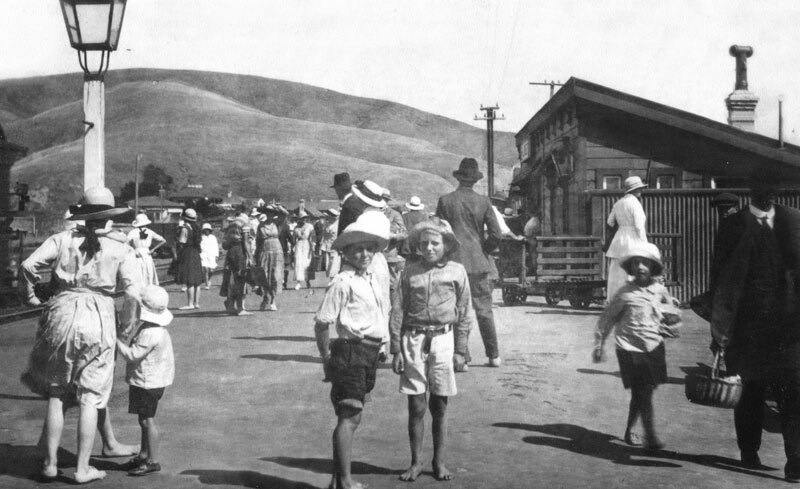 The railway was a vitally important factor in the early growth of Plimmerton as it facilitated both easy access to the coast, and the delivery of construction materials from Wellington. The final spike of the line between Wellington and Palmerston North was driven by Governor, Sir W D Jervois, at Otaihanga near Waikanae on 3 Nov 1886. The Premier, Sir Robert Stout and members of the W&MRC board of Directors were present along with more than 500 people. Joe Boulton tells a story that by the turn of the century (1900) there was a regular train timetable operating. The first train left Paekakariki about 6 am and arrived at Plimmerton at 7.15 am. The driver and fireman knew all their passengers personally. If a passenger wasn’t on the platform they would enter their cottage and wake them up. If necessary, they made them a cup of tea then, when all were on board, the train left from Paremata ….. now that is service. The second train left Palmerston North at 7.00 am and arrived at Plimmerton 11.30 am. It had a dining car managed by Len Freeman who served breakfasts and morning teas. Papers, magazines and cigarettes were sold by a man walking through the carriages. There were about 4 trains through Plimmerton in each direction every day. 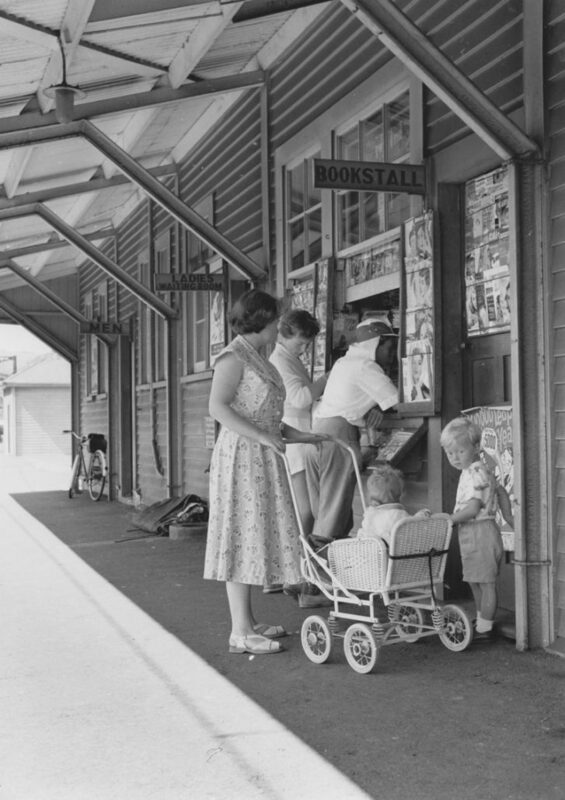 Before there were shops at Plimmerton people tied their milk order to the handle of an empty can and put it on the 5.20 pm train north to Pukerua Bay. The can was returned with the required milk on the first train next morning …. and there was no charge for carrying the cans and milk back and forth. By 1900, excursion trains from Wellington cost 2 shillings and 6 pence return. Second class carriages had seats running lengthways; one carriage was divided in half, one part first class and the other for smokers, with brass spittoons set in the floor. Until 1937 when the current tunnels were opened the trains followed the Johnsonville line then ran down the Glenside valley more or less where the line runs now. Two engines were needed to take trains up the Ngaio Gorge. During winter the early and late trains has foot warmers – large copper cylinders with a handle at one end and filled with some chemical substance. It took a strong man to hold the handle and shake the cylinder vigorously for a faint warmth to penetrate the metal. They were still in use at the end of the 1920’s. The original single-track railway line was duplicated through Plimmerton in the late 1930s and this led to some changes along the line, including the replacement of several stations to better serve the new double tracks. A plan was approved by New Zealand Railways to replace the original station with a new ‘island’ type, to be located between the double tracks, in 1939 and work started in that year. The building was in use by February 1940, but was not fully completed until September that year when the old station was demolished. The station remains in constant and heavy commuter use. The building was closed to the public for a number of years, but remained in rail use for signal control purposes, via the signal panel enclosed in the main building. Since reopening in 2010 Mack’s Track model railway business has been located in the station and is well worth a visit as it includes many historic pictures, memorabilia and railway books and models for sale. The station is an “island” type, with the two rail tracks passing on either side of the long platform and the building in the middle of the tracks. The north end of the platform is accessed through a short subway that connects through to both Steyne Avenue and the Plimmerton Domain. The south end of the platform can be reached from the level crossing between Steyne Avenue and State Highway 1. The Station was closed to freight traffic in 1989 and part of the yard leased out. This rail yard area to the east is used by Mainline Steam (a train restoration group) and includes a relocated water-tower and a modern locomotive turntable – although this doesn’t contribute to the station’s authenticity, this helps create a strong impression of the area’s railway purpose and its long history of railway use. Completed in 1940, the station building is constructed to a standard plan, one originated by railway architect George Troup in the early 1900s (while Troup retired from the railways in 1925, the standard floor plans were built for many years after his departure). It is centred on the platform and has a long rectangular layout, one room wide, which contained (from south to north) men’s and ladies’ toilets, ladies’ waiting room, bookstall, general waiting room, office and booking office and a store room. The small rectangular out-building on the platform to the north of the station once housed an emergency signal panel (there is a second out-building to the south).